Click here to see the 2016 Grow Smart Awards program. Blaine County’s Wood River Valley offers beautiful scenery as well as transportation challenges, including an increase in bicycle and pedestrian activity. The regional transit agency recognized the need to pull together a region-wide plan to help manage this growth, and organized a large working group representing the county, cities, heath care, transportation, recreation and community interests. The result was a plan that builds on the bicycle/pedestrian pathway that bridges all those interests: the popular Wood River Trail. 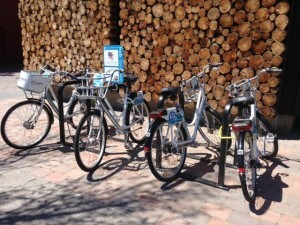 The plan recommends improvements, connections and facility projects throughout the trail’s length. This highway bridge, known as the Lardo Bridge in McCall, built in 1931, had r eached the end of its useful life and was scheduled for replacement in 2014 by the Idaho Transportation Department. 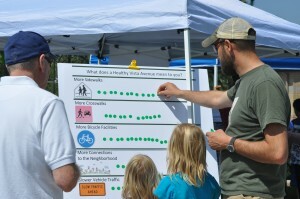 Because the bridge is heavily traveled and is an important local bicycle/pedestrian connection, the city of McCall began working early with ITD to make the most of the design opportunity. 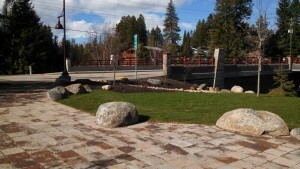 Close collaboration between city departments, ITD, the contractor and the community resulted in a design that now has bike lanes and sidewalks in both directions, a “belvedere” viewing and fishing platform over Payette Lake, and integration facilities for public art, historical interpretation, lighting and city utilities. Sometimes simple actions have complex results. Building on downtown M eridian’s Lighter, Quicker, Cheaper placemaking project of 2015, one block of Idaho Avenue became the first site for further placemaking implementation. 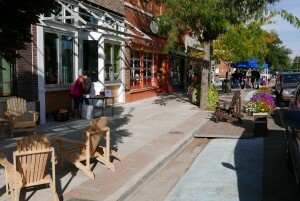 In spite of active restaurants and public spaces at its end, the street’s middle section was “sleepy” and not especially conducive to business development. One local businessman seized the opportunity and together with support from the downtown business association, the city, redevelopment agency and others including Idaho Smart Growth, arrived at a vision for temporary changes to the street to promote activity while maintaining on-street parking. Floating parking, new paint, flower planters and decks extending into the roadway serve to widen the sidewalk and provide places for tables, chairs and other activity that make the street more inviting. Later programmed activities will invite people to explore this new place and enhance its vibrancy. This project is an example of synergy in partnerships accomplishing multiple goals. The effort originated in an ongoing interest of Idaho State University to vacate a portion of Martin Luther King, Jr. Way on its campus. Closing the street was not feasible but prior planning had identified support for improving the corridor. The city and ISU staff collaborated on planning and the metropolitan planning organization conducted a pedestrian and traffic study along the corridor. The new design reduced the street’s width about a third, with narrowed lanes and wider sidewalks. The projected increased safety and vitality in the corridor by calming traffic and improving accommodations for buses, bicyclists and pedestrians. New landscaping contributes to the quality of the space and a bonus is integrated rain gardens that help the city meet its storm water treatment requirements. This feature caught the jury’s attention as an affordable innovation that provides important aesthetic and environmental benefits, and could be replicated throughout Idaho. Library Square is a public-private partnership that accomplishes far more than any of the many partners could have done singularly. 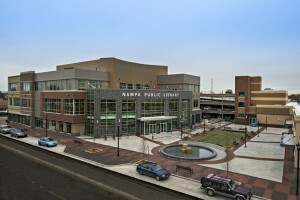 Nampa’s library and business associations, the redevelopment agency, several city departments, the developer, contractor and citizens are all to be congratulated for working together to deliver an exemplary project that demonstrates a number of smart growth principles. Library Square includes the library, two retail/office buildings, a public parking garage, and a public plaza with benches, fountain, open lawn and bicycle parking. The project is the result of community involvement dating back to 2004 with the Central Nampa Revitalization Blueprint, the guiding document for the Nampa Development Corporation. The vision from the beginning was that the library would serve as a catalyst for community and economic development. involved four counties in two states with a multitude of stakeholders working together to create a plan for regional sustainability and resiliency. This breadth of involvement is impressive, especially for a regional plan that includes so much detail. It does what a plan should do in providing clear direction for the region’s growth and addresses regional resources beyond land use with a view toward sustainability. This plan recognizes that sustainable communities are not islands but part of a region and they are sustained through preservation of place–not just resource conservation but preservation of the social fabric, the economy, transportation and housing. Boise’s Vista Avenue is the gateway connecting the airport to downtown, and on to the rest of Idaho. Unbecoming a gateway, however, Vista is a typical auto-oriented strip commercial street, with few bicycle and pedestrian accommodations, that turns its back on the surrounding Vista and Depot Bench neighborhoods. 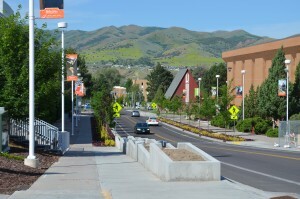 This project, led by the Urban Land Institute in cooperation with the city, highway district, Boise State University and neighborhood associations, is a study of a corridor through the lens of health, with the goal of finding ways to improve area residents’ physical health and safety as well as the economic and social health of the district. One of four similar ULI projects around the country, the Vista project included workshops, tours, stakeholder interviews and planning that led to a set of recommendations on infrastructure, land use, economic development and cultural and social connectivity. This remarkable redevelopment of historic vacant buildings in the heart of downtown Idaho Falls began in the early 1990s when several groups developed an interest in rebuilding their downtown. Downtown property owners formed the Idaho Falls Downtown Corporation at the same time that the city was rewriting its comprehensive plan and identified the need for a reinvention of downtown. Meanwhile, the Idaho Falls Arts Council was searching for a facility that could house performance arts. The effort coalesced around the shuttered Paramount Theater, a former vaudeville theater and one of only three large theaters of historic significance left in Idaho. 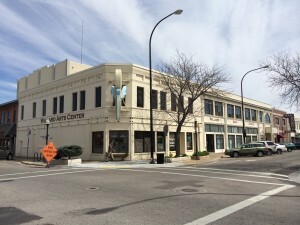 The result is the Willard Arts Center and Colonial Theater, a visual and performing arts center which brings more than 60,000 patrons to downtown annually, and has served as a catalyst for an arts renaissance which redefined downtown as a regional cultural center and vibrant community gathering place. “Infill” is new development that fills in places where other development–and roads, services and people already exist. 36 Oak in Garden City is a cottage development pattern that is somewhat new in the Boise area and provides a nice example of single family infill that increases density without overwhelming the surrounding neighborhood. 36 Oak is the initial project of NeighborWorks Boise’s “pocket neighborhood” development approach that features small cottages clustered within exiting, established neighborhoods. This approach is so successful they have already begun replicating it in two other locations. Renée is one of those people whose actions speak louder than her words. She has impressive work experience, education and accomplishments in the fields of land use planning, community redevelopment and historic preservation but it is her quiet dedication to people, process and results that makes her exemplary. 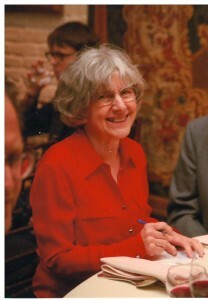 She strongly believes any community planning effort must start by asking citizens open-ended questions, not leading ones. “Start with a blank sheet of paper” is Renée’s motto. It’s one we would all do well to adopt.